Many years ago, James and I were watching the news and the commentator was talking about the new Ministry of Transportation rules here in Canada for children sitting in the front seat. “Children must be four feet nine and over to sit in the front seat.” The commentator went on to inform listeners that anyone who did not comply with the new rules would be slapped with an expensive fine. With new technologies and powerful air bags, it was obvious that the Ministry wanted to protect children. At the time, my height was (and still is) four feet nine inches tall (which I’m told is the average height of a ten year old). I turned to my husband and said, “How do they expect me to drive from the back seat?” We laughed about it, then I realized, “Uh-oh. Maybe I’m not allowed to drive.” A quick call to the Ministry confirmed that it would not be against the law if I continued to drive, nor would I be given any fine. I breathed a sigh of relief. 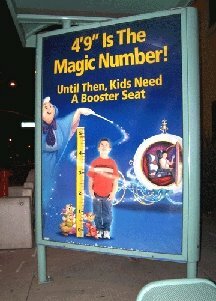 Later, there was an ad campaign in the United States (see photo) saying that kids needed to be four feet nine or taller in order to be out of a booster seat. 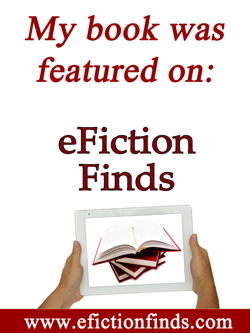 So when I saw this particular photo, I laughed out loud. Of course, I think it’s pretty neat that my height is a magic number. It isn’t, of course, the magic number when I’m in the grocery store or a department store. Usually, at least once a week, it’s necessary for me to ask a kind tall person to reach something on a high shelf. Other than unreachable groceries, however, I enjoy being short, especially now that I’m older. It isn’t, of course, the magic number when I’m in the grocery store or a department store. Usually, at least once a week, it’s necessary for me to ask a kind tall person to reach something on a high shelf. Other than unreachable groceries, however, I enjoy being short, especially now that I’m older. Next Thursday, I’ll be sharing a few advantages of being short.